Our beard scissors are not only functionally awesome, but also beautiful to look at. They have surgical sharp blade, it is made of Japanese steel and has a HRC rating of 59-60. The handle is ergonomically shaped and designed, fit most masculine hands comfortable. It also contains detachable buffers (rubber inserts) for small fingers. The beard brush bristle are 100% natural boar and firm enough to untangle even the most stubborn hairs while making your beard soft to touch. It also stimulates the natural oil (sebum) in the scalp and draws them along the hair shafts, essential for keeping hair clean, healthy, shiny and protected. The brush works well with beard balm, oil and wax. The handmade comb is made from black sandalwood and has a pleasant woody scent that stays with you after you've combed your beard. With its finer teeth and wider teeth will be able to suit most men's beards whether they are either on the thicker or thinner side. The comb is great for use with beard balms and oils and you don't have to worry about the pulls, snags and static of cheaper plastic comb. Beard grooming can be challenging, especially when trying to get clean lines along your neckline or blend the cheek line on the top of your beard. Luckily, with help from a cleverly designed beard trimming tool, you can easily get the shape you want every time. You can use the shaping tool to shape your beard into many different shapes, whether it's full beard, pencil beard, goatee, it's versatile to do many shapes and styles. 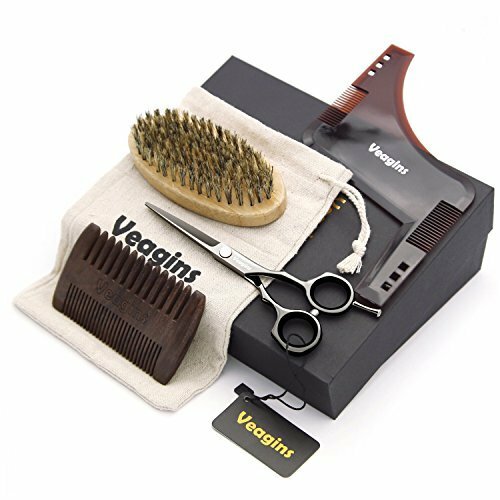 MAKE STYLING EASY - Grooming, trimming, shaping and taming your beard & mustache was never easier with the combination of VEAGINS' extra sharp stainless steel barber beard scissors, 100% boar bristle brush, black sandalwood beard comb, and beard shaping tool. SURGICAL SHARP MUSTACHE SCISSORS - The 5.5"beard scissors have surgical sharp blade, it is made of Japanese steel and has a HRC rating of 59-60. 100% BOAR BRISTLE BEARD BRUSH - natural boar bristles stimulates the natural oil (sebum) in the scalp and draws them along the hair shafts, essential for keeping hair clean, healthy, shiny and protected. The brush works well with beard balm, oil and wax. HANDEMADE ANTI STATIC & SNAG FREE BEARD COMB - The handmade comb is made from black sandalwood and is great for use with beard balms and oils and you don't have to worry about the pulls, snags and static of cheaper plastic comb. PERFECT GIFT & WARRANTY - This beard kit comes packed in a luxury premium gift box. It's a great gift for a bearded friend, husband, father that could use some beard care products to tame up his beard and mustache! It includes 1 years free replacement warranty! If you have any questions about this product by Veagins, contact us by completing and submitting the form below. If you are looking for a specif part number, please include it with your message. Beard Care Grooming Kit for Men - Boar Bristle Beard Brush, Sandalwood Beard Comb and Facial Hair Trimming Scissors by GentlemanRa.